(1) Corrosion: Corrosion reduces the number of cycles required to reach for every stress amplitude. (2) Surface finish: surface finish , such as tool marks or scratches. (3) Temperature: as a consequence of oxidation or corrosion of the metal surface increasing, increase in temperature can lead to a reduction in fatigue properties. (4) Internal voids such as shrinkage cracks and cooling cracks in castings and weldments. (5) Defects, stresses introduced by electroplating. (6) stress concentration points like notches, key ways, screw threads and machining under cuts. It occurs at lower stress than the failure at static load, i.e., lower than the yeild strength or ultimate strength. Failure starts on the surface (or near it) locally, in places of stress (strain) concentration. Local stress concentrations are formed by surface defects appearing on cyclic loading or notches as traces of surface treatment or the effect of the surrounding medium. Failure occurs in number of stages; accumulation of defects in the material: nucleation of fatigue cracks; gradual propagation and joining of some cracks into single main crack; and rapid final destruction. Failure has the typical structure which reflects the sequence of fatigue processes. A failure usually has the initial zone of destruction (the zone of nucleation of micro cracks), the fatigue zone, and the final failure zone (above Fig.). The initial zone of failure is usually near the surface and has small size and smooth surface. 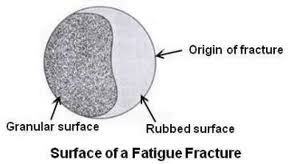 The fatigue zone is the zone where a fatigue crack gradually develops. It has typical concentric ripple lines which are an evidence of jump wise propagation of fatigue cracks. The fatigue zone develops until the increasing stresses in the gradually diminishing actual section attain a level at which instantaneous destruction takes place and forms the zone of final failure. (i)-Surface imperfections like machining marks and surface irregularities. (ii)-Stress concentrations like notches, keyways, screw threads and matching undercuts. (iii)- At low temperature the fatigue strength is high and decreases gradually with rise temperature. 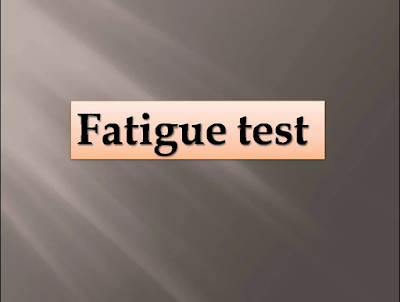 (iv) Fatigue strength reduces by corroding environments. Following surface treatments like polishing, coating, carburizing, nitriding, etc., their effect can be reduced. 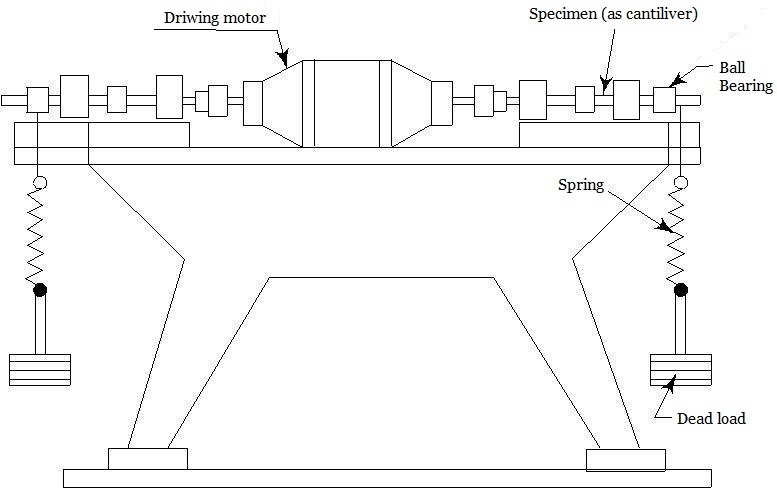 Figure shows a diagrammatic sketch of Wohler fatigue testing machine. In this machine, the specimen in the form of cantilever forms the extension of a shaft which is driven by an electric motor. Through a ball bearing, dead loading is applied to the specimen. When the machine is in action i.e., it runs, the specimen rotates and the fibres of the specimen are subjected to reversed stresses. In some instances the specimen is tapered or a two point loading is applied to obtain a uniform surface stress over a considerable length of specimen. To cause failure the number of cycles vary with applied stress. When stress is higher, fewer are the cycles required for causing the fracture. Obviously, a stress is reached below which fracture would not take place within the limits of a standard test and this is termed as 'endurance limit'. 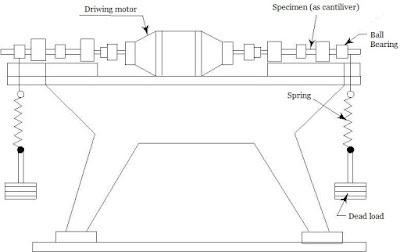 The length of such a standard test depends on the material being tested and types of loading. Usually it is of the order of 5,00,000 cycles for very hard steels, 50,00,000 for soft steels; 100,00,000 for cast steel and cast iron; and for non-ferrous metals and alloys from 10,00,000 to about 5,00,00,000. If the fracture does not take place within these limits, then it is understood that it will not take place at all. There are certain well defined characteristics for fatigue failures of metallic materials. The fractured surface frequently exhibit two distinct zones. One can find the cause of the failure by careful examination of such a failure. There is a smooth part usually showing concentric markings starting from a nucleus stress raisers, and rougher part often presenting crystal line faces.